This earthquake happened last night as I was preparing course materials for this morning. Initially it was a magnitude 6.9, but later modified to be M 6.9. This earthquake happened in an interesting region of the world where there is a junction between two plate boundaries, the Kamchatka subduction zone with the Aleutian subduction zone / Bering-Kresla Shear Zone. The Kamchatka Trench (KT) is formed by the subduction (a convergent plate boundary) beneath the Okhtosk plate (part of North America). The Aleutian Trench (AT) and Bering-Kresla Shear Zone (BKSZ) are formed by the oblique subduction of the Pacific plate beneath the Pacific plate. There is a deflection in the Kamchatka subduction zone north of the BKSZ, where the subduction trench is offset to the west. Some papers suggest the subduction zone to the north is a fossil (inactive) plate boundary fault system. There are also several strike-slip faults subparallel to the BKSZ to the north of the BKSZ. These are shown in two of the inset maps below. I plot the seismicity from the past month, with color representing depth and diameter representing magnitude (see legend). I include the USGS epicenters for earthquakes from 1917-2017 with magnitudes M ≥ 7.0 (the search window is limited to the region west of the Amlia fracture zone). 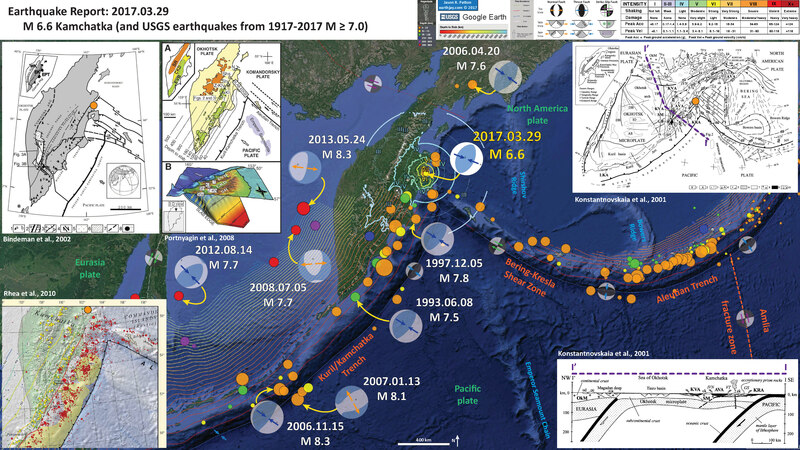 The pair of earthquakes 2008.07.05 M 7.7 and 2013.05.24 M 8.3 are very deep earthquakes (the M 8.3 is one of the largest and deepest earthquake ever recorded by modern seismometers) and may be due to bending of the downgoing slab. 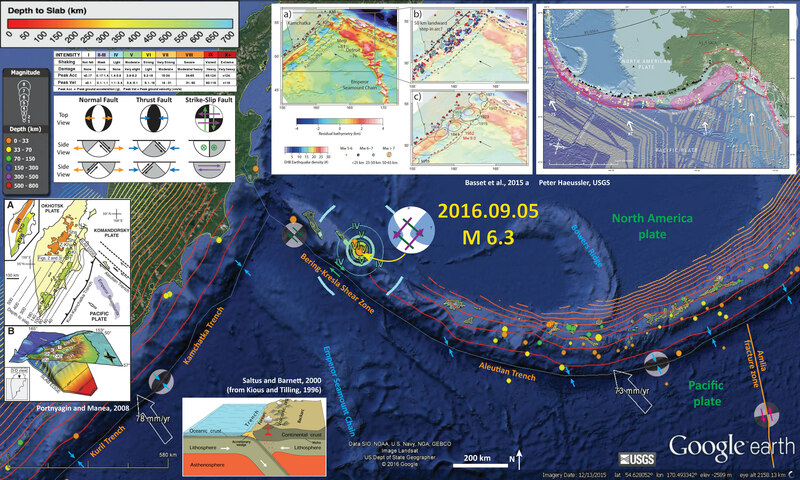 Here is my report for the M 8.3 (it was an early report of mine). The pair of earthquakes 2006.11.15 M 833 and 2007.01.13 M 8.1 are directly related to each other. Lay et al. (2009) discussed this earthquake sequence and how the 2006 subduction zone earthquake led to the 2007 outer-rise earthquake in the Pacific plate. Dr. Erica Emry studied this earthquake pair for her Ph.D. research. I also wrote a little about these earthquakes in my earthquake report here. The largest earthquake plotted for this region is the 1952 M 9.0 earthquake (the large epicenter between teh 1993 and 1997 earthquakes. This earthquake is the 5th largest earthquake recorded by modern seismometers. However, there is no USGS moment tensor (I couldn’t find a focal mechanism either). This earthquake generated a tsunami that traveled across the Pacific. I placed a moment tensor / focal mechanism legend on the poster. There is more material from the USGS web sites about moment tensors and focal mechanisms (the beach ball symbols). Both moment tensors and focal mechanisms are solutions to seismologic data that reveal two possible interpretations for fault orientation and sense of motion. One must use other information, like the regional tectonics, to interpret which of the two possibilities is more likely. I suspect that the fault that ruptured is eastward vergent (dipping to the west), so the west dipping nodal plane is probably the primary fault plane. However, this region of Kamchatka has numerous upper plate thrust and reverse faults (so the primary fault plane could be the other one, dipping to the east). In the upper left corner I include a map that shows the tectonic setting of this region, with the major plate boundary faults and volcanic arc designated by triangles (Bindeman et al., 2002). I placed an orange circle in the general location of the M 6.6 earthquake (sized relative to the magnitude range in the main map). Note the reverse fault mapped to the northeast of the epicenter. This fault dips to the southeast, supporting the east dipping solution for the M 6.6 moment tensor. I post this figure and their figure caption below. To the right of this figure, I include a figure from Portnyagin and Manea (2008 ) that shows a low angle oblique view of the downgoing Pacific plate slab. I post this figure and their figure caption below. In the lower left corner I include a map from the USGS Open File report (Rhea et al., 2010) that explains the historic seismicity for this region. I also plot the epicenter (orange dot). In the upper right corner I include a map that shows more details about the faulting in the region. I place the epicenter for the M 6.6 as an orange circle. The location of the cross section I-I’ (plotted in the lower right corner) is designated by a dashed purple line. Here is the tectonic map from Bindeman et al., 2002. The original figure caption is below in blockquote. Tectonic setting of the Sredinny and Ganal Massifs in Kamchatka. Kamchatka/Aleutian junction is modified after Gaedicke et al. (2000). Onland geology is after Bogdanov and Khain (2000). 1, Active volcanoes (a) and Holocene monogenic vents (b). 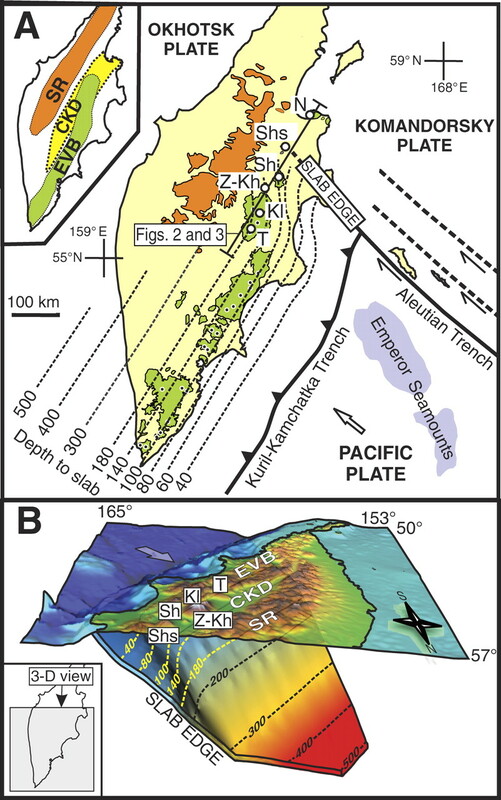 2, Trench (a) and pull-apart basin in the Aleutian transform zone (b). 3, Thrust (a) and normal (b) faults. 4, Strike-slip faults. 5–6, Sredinny Massif. 5, Amphibolite-grade felsic paragneisses of the Kolpakovskaya series. 6, Allochthonous metasedimentary and metavolcanic rocks of the Malkinskaya series. 7, The Kvakhona arc. 8, Amphibolites and gabbro (solid circle) of the Ganal Massif. Lower inset shows the global position of Kamchatka. Upper inset shows main Cretaceous-Eocene tectonic units (Bogdanov and Khain 2000): Western Kamchatka (WK) composite unit including the Sredinny Massif, the Kvakhona arc, and the thick pile of Upper Cretaceous marine clastic rocks; Eastern Kamchatka (EK) arc, and Eastern Peninsulas terranes (EPT). Eastern Kamchatka is also known as the Olyutorka-Kamchatka arc (Nokleberg et al. 1998) or the Achaivayam-Valaginskaya arc (Konstantinovskaya 2000), while Eastern Peninsulas terranes are also called Kronotskaya arc (Levashova et al. 2000). This map shows the configuration of the subducting slab. The original figure caption is below in blockquote. Kamchatka Depression (rift-like tectonic structure, which accommodates the northern end of EVB); SR—Sredinny Range. Distribution of Quaternary volcanic rocks in EVB and SR is shown in orange and green, respectively. Small dots are active vol canoes. Large circles denote CKD volcanoes: T—Tolbachik; K l — K l y u c h e v s k o y ; Z—Zarechny; Kh—Kharchinsky; Sh—Shiveluch; Shs—Shisheisky Complex; N—Nachikinsky. Location of profiles shown in Figures 2 and 3 is indicated. B: Three dimensional visualization of the Kamchatka subduction zone from the north. Surface relief is shown as semi-transparent layer. Labeled dashed lines and color (blue to red) gradation of subducting plate denote depths to the plate from the earth surface (in km). Bold arrow shows direction of Pacific Plate movement. Here is the more detailed tectonic map from Konstantinovskaia et al. (2001). This is the cross section associated with the above map. Here is the Rhea et al. (2010) poster. 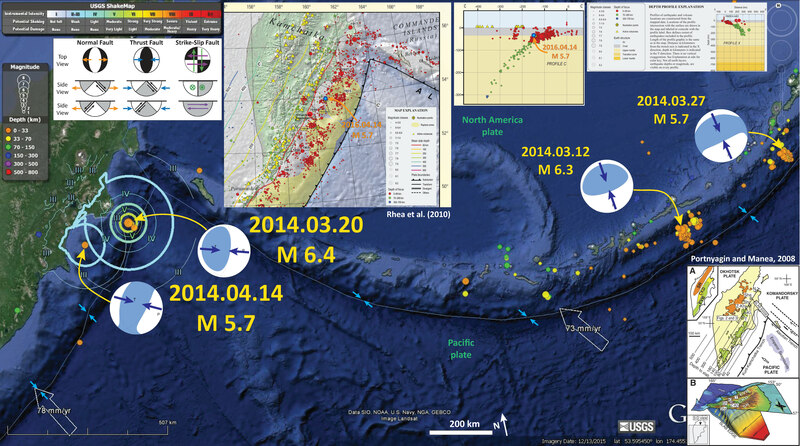 In 2014, there were a couple of earthquakes to the south of this M 6.6. Here is my earthquake report for those earthquakes and the poster is below. In 2016 there was an earthquake that appears to be associated with the Bering-Kresla Shear Zone. Here is my earthquake report for that earthquake and I include the poster below. Bindeman, I.N., Vinogradov, V.I., Valley, J.W., Wooden, J.L., and Natal’in, B.A., 2002. Archean Protolith and Accretion of Crust in Kamchatka: SHRIMP Dating of Zircons from Sredinny and Ganal Massifs in The Journal of Geology, v. 110, p. 271-289. Konstantinovskaia, E.A., 2001. Arc-continent collision and subduction reversal in the Cenozoic evolution of the Northwest Pacific: and example from Kamchatka (NE Russia) in Tectonophysics, v. 333, p. 75-94. 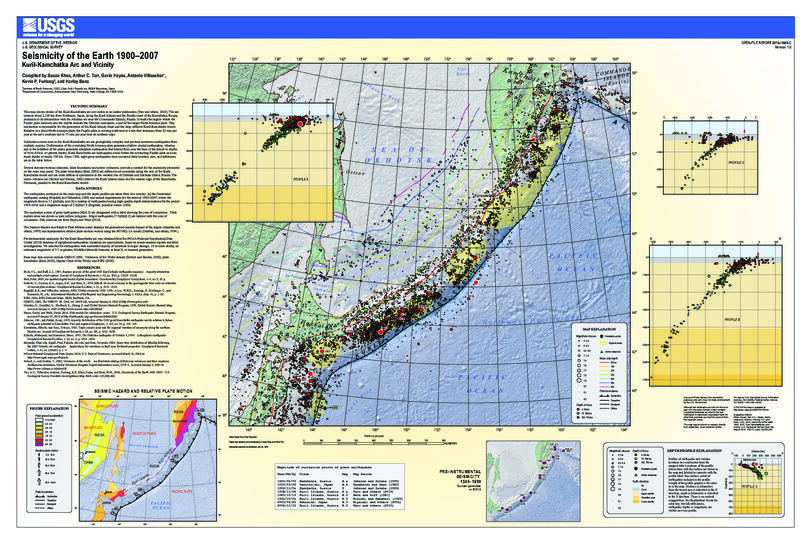 Rhea, Susan, Tarr, A.C., Hayes, Gavin, Villaseñor, Antonio, Furlong, K.P., and Benz, H.M., 2010, Seismicity of the earth 1900–2007, Kuril-Kamchatka arc and vicinity: U.S. Geological Survey Open-File Report 2010–1083-C, scale 1:5,000,000.